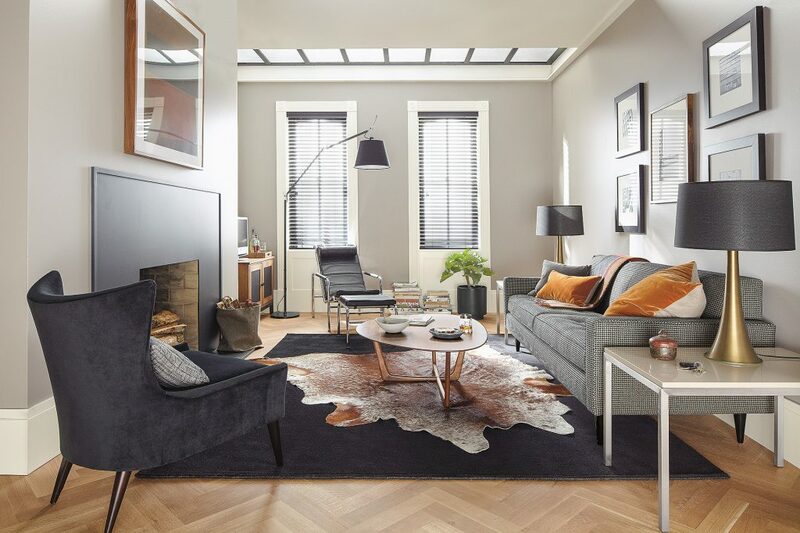 Long before Mad Men propelled mid-century design into popularity again, Room & Board channeled design details from this much-loved era to create some of our favorite collections. Elements like tapered legs, organic lines, and mixed materials top our list of favorites. Here’s how we’ve used mid-century design details, and how you can incorporate these same details into your own personal style–without making your home look like a time capsule. 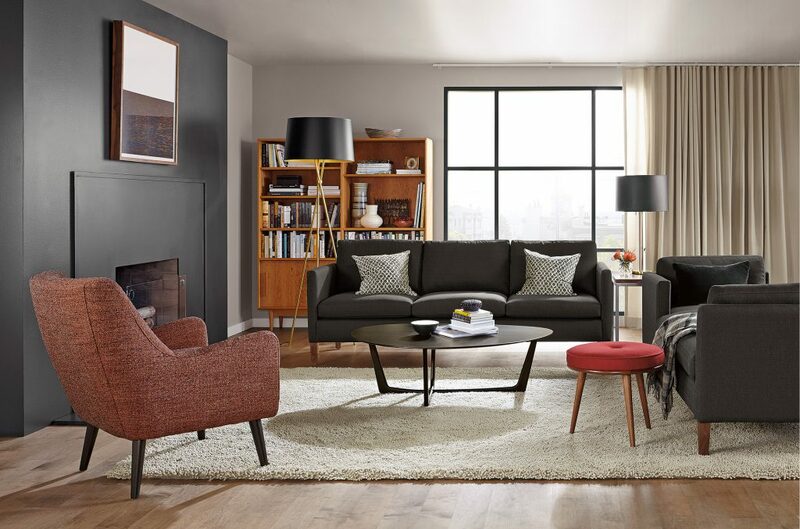 Tapered, rounded legs are one of the most recognizable elements of mid-century design. They showed up everywhere–on sofas, end tables, cabinets, and dining chairs– for a good reason. They help lend pieces the visual lightness the era is known for. Use this design element in your home to make a small room feel more spacious or to make large pieces seem lighter. For example, the Lola chair and Reese sofa (above) while relatively large, don’t look it thanks to their tapered legs. The space underneath tricks the eye. Mid-century design embraced clean lines, but not always straight ones. The organic, nature-inspired lines of the time were curvy and fluid, giving everything a certain softness. Even normally angular furniture, like tables, developed a softer side. 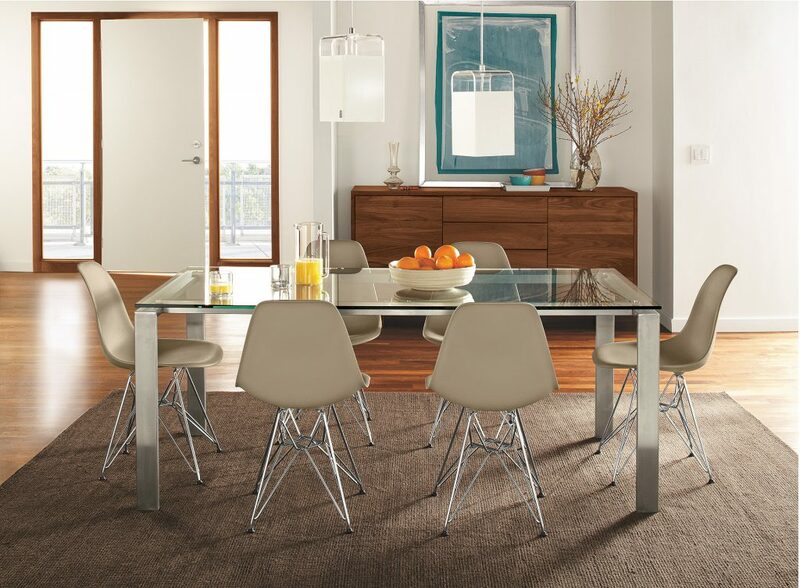 The Saarinen table is a prime example the fluid lines often found in mid-century design. Incorporating a few pieces with soft curves helps a room remain approachable and warm amid other modern pieces. For example, our Dunn coffee table and Quinn chair, above, embrace their mid-century inspired curves but still work with other furniture seamlessly. Mid-century designers had access to new materials, like plastic, molded plywood and fiberglass. These new materials ushered in an era of experimentation and mixing. Iconic examples of this material-inspired style include Eames® chairs (above) and Nelson pendants. We’ve taken a page from this book, too, with pieces like our Pike chairs, Cooper bench and top + base tables. Mixing in unexpected materials keeps your style adaptable and lets you break free from always matching finishes. In the example above, the combination of glass, steel, wood and plastic makes this room feel fresh. What other elements of mid-century design inspire your personal style?